150:1.1 Of all the daring things which Jesus did in connection with his earth career, the most amazing was his sudden announcement on the evening of January 16: "On the morrow we will set apart ten women for the ministering work of the kingdom." At the beginning of the two weeks' period during which the apostles and the evangelists were to be absent from Bethsaida on their furlough, Jesus requested David to summon his parents back to their home and to dispatch messengers calling to Bethsaida ten devout women who had served in the administration of the former encampment and the tented infirmary. These women had all listened to the instruction given the young evangelists, but it had never occurred to either themselves or their teachers that Jesus would dare to commission women to teach the gospel of the kingdom and minister to the sick. These ten women selected and commissioned by Jesus were: Susanna, the daughter of the former chazan of the Nazareth synagogue, Joanna, the wife of Chuza, the steward of Herod Antipas; Elizabeth, the daughter of a wealthy Jew of Tiberias and Sepphoris; Martha, the elder sister of Andrew and Peter; Rachel, the sister-in-law of Jude, the Master's brother in the flesh; Nasanta, the daughter of Elman, the Syrian physician; Milcha, a cousin of the Apostle Thomas; Ruth, the eldest daughter of Matthew Levi; Celta, the daughter of a Roman centurion; and Agaman, a widow of Damascus. 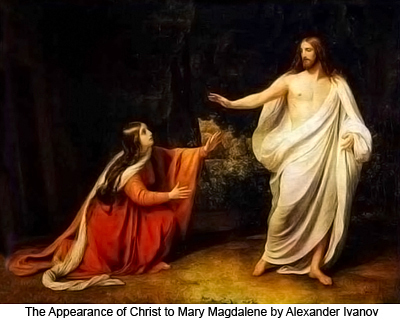 Subsequently, Jesus added two other women to this group—Mary Magdalene and Rebecca, the daughter of Joseph of Arimathea. 187:3.2 Standing near the cross at one time or another during the crucifixion were Mary, Ruth, Jude, John, Salome (John's mother), and a group of earnest women believers including Mary the wife of Clopas and sister of Jesus' mother, Mary Magdalene, and Rebecca, onetime of Sepphoris. These and other friends of Jesus held their peace while they witnessed his great patience and fortitude and gazed upon his intense sufferings. 187:5.4 The sandstorm grew in intensity and the heavens increasingly darkened. Still the soldiers and the small group of believers stood by. The soldiers crouched near the cross, huddled together to protect themselves from the cutting sand. The mother of John and others watched from a distance where they were somewhat sheltered by an overhanging rock . When the Master finally breathed his last, there were present at the foot of his cross John Zebedee, his brother Jude, his sister Ruth, Mary Magdalene, and Rebecca, onetime of Sepphoris. 188:1.7 While all this was going on, the women were hiding near at hand so that they saw it all and observed where the Master had been laid. They thus secreted themselves because it was not permissible for women to associate with men at such a time. 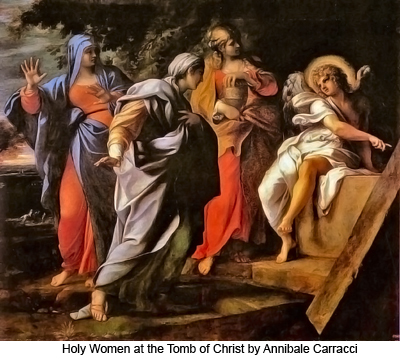 These women did not think Jesus had been properly prepared for burial, and they agreed among themselves to go back to the home of Joseph, rest over the Sabbath, make ready spices and ointments, and return on Sunday morning properly to prepare the Master's body for the death rest. The women who thus tarried by the tomb on this Friday evening were: Mary Magdalene, Mary the wife of Clopas, Martha another sister of Jesus' mother, and Rebecca of Sepphoris. 189:4.7 After Mary had tarried in the doorway of the tomb for a few moments (she did not see distinctly when she first entered the tomb), she saw that Jesus' body was gone and in its place only these grave cloths, and she uttered a cry of alarm and anguish. All the women were exceedingly nervous; they had been on edge ever since meeting the panicky soldiers at the city gate, and when Mary uttered this scream of anguish, they were terror-stricken and fled in great haste. And they did not stop until they had run all the way to the Damascus gate. By this time Joanna was conscience -stricken that they had deserted Mary; she rallied her companions, and they started back for the tomb.